This week I’ve been sketching in an A4 Moleskine, the big horizontal book with the old paper that I liked so much when I started to sketch (not the newer Art Plus version). I bought this book many months ago, but because it’s quite expensive (in Canada at least) I think I’ve been saving it for something special. That seems a bit silly to me now so I threw it in my bag at the beginning of the week and have been using it every day. It’s a bit like rediscovering an old friend and I’m happy to get reacquainted. This semester I find myself with a long midday break in my Friday teaching schedule. That means one thing. 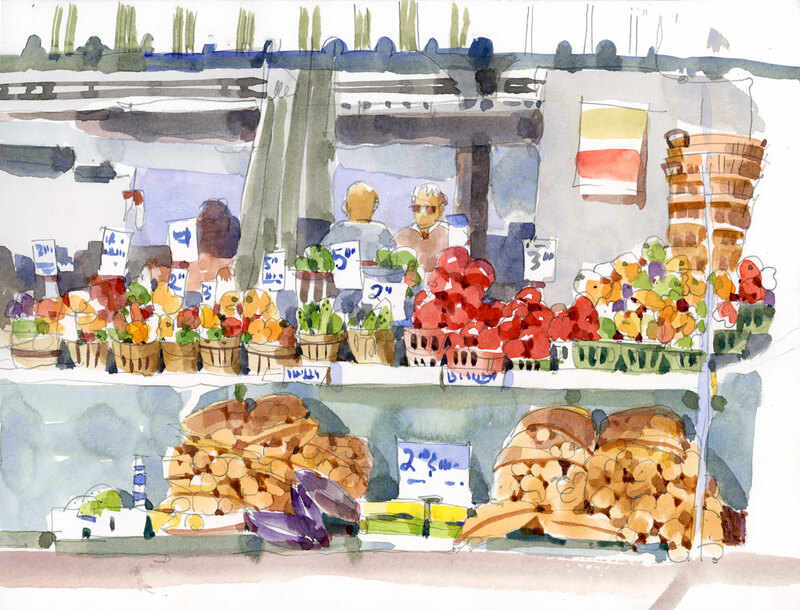 I have time to get to the Jean Talon Market to sketch! What a great time of year to revisit my favourite Montreal sketching place after a long absence. Abundance is the first word that comes to mind. Overgrown zucchini, boxes of fat tomatoes, the first shiny apples, blueberries ready for jam… it was hard to decide what to sketch. 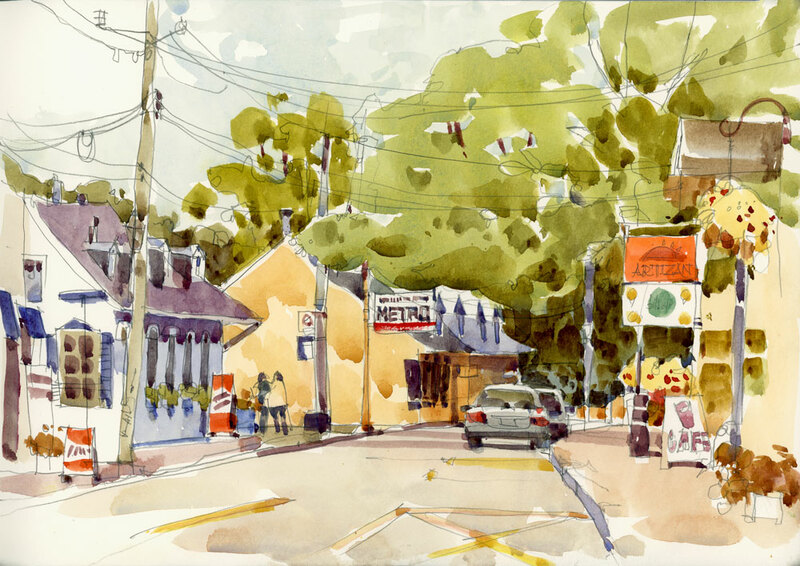 In the end it was determined by what I could see from a spot at the picnic tables where I had a view on all the comings and goings and a place for my coffee as well as my paints. 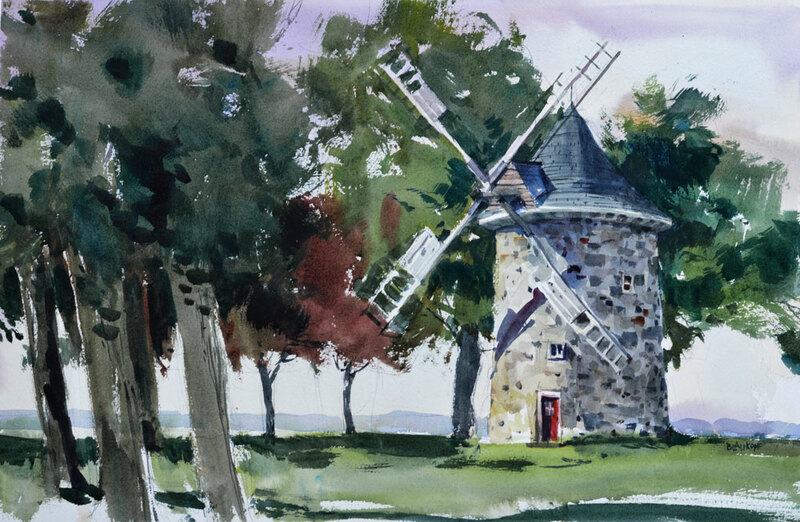 If you live in or near Montreal, I hope you’ll be able to join me next weekend (September 6 & 7) at Art by the Lake, the annual outdoor show of the Lakeshore Association of Artists. 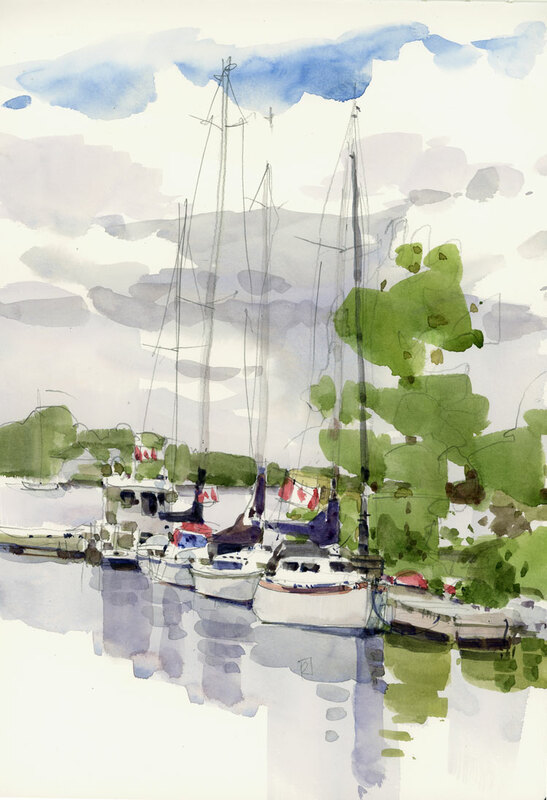 It’s at quite an amazing location — 50 artists set up on the lakeside grounds of Stewart Hall in Pointe Claire — and a wonderful way to spend an early September afternoon. This will be my second year taking part in the show and hopefully this year will be easier than last when the wind blowing off the lake was fierce. It took all my strength to keep my canopy from flying away and knocking down all my paintings in the process. 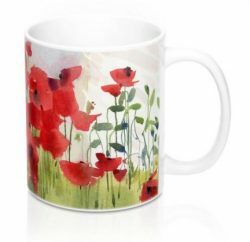 As with all the shows that the LAA puts on, a portion of the proceeds will go to a worthy cause — in this case a scholarship for a John Abbott College art student. The show runs from 10 am to 5 pm on both days so please come out to say hello and see all the wonderful artists in our group. In today’s sketch I used a technique I practice often in landscape painting but not too frequently when I paint a still life. My first wash (the warmish one) covers everything except the white areas that I want to save. The subsequent layers of paint, applied in glazes, are used to build up the mid-tones and darks. 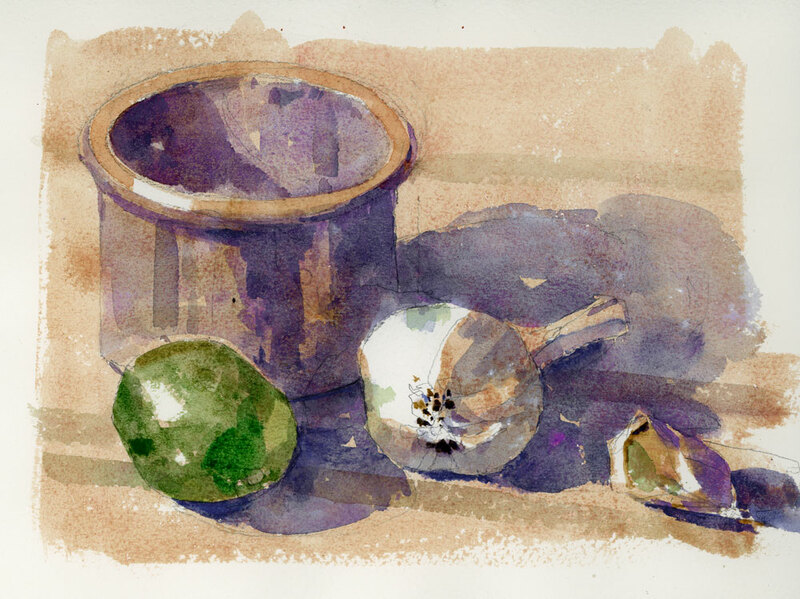 The hope, of course, is that that first warm wash will unify the sketch and that the garlic and lime will flavour a Mexican meal. On my drive home from work I heard on the radio that today is International Dog Day. I celebrated the event by taking my dog for a walk and then sketching her. As you can see it took her a while to get comfortable. It was a bit of a shock to get back to school today, both for me and for the students. It’s one of the nicest days of the summer and I think we were all in a bit of a daze to be back in the classroom. The start of the school year also marks the end of being able to work on large paintings, at least until the weekend. I took my sketchbook out to paint some sunflowers and ended up painting them two ways. The first sketch was in my regular sketchbook. I quickly realized two things. 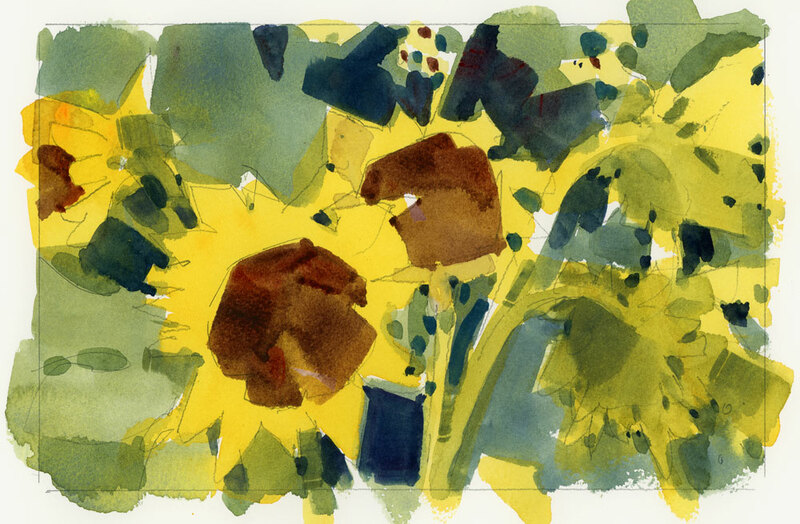 1: Sunflowers are hard to paint because the dark centres create a hole in the composition. 2. I have been spoiled by working on good watercolour paper for the last month or so and now it’s very difficult to go back to working in a book. That led me to redo the sunflowers. 1. I wanted to solve the problem of the dark centres. 2. I needed to work on some good paper. I moved to another room (so as not to have the flowers in front of me) and started again. From my sketch I did a simpler sketch and this time instead of the having the centre of the flower as the darkest shape, I added an even darker area behind the flowers. I think that solved the problem of the hole. I also tried to keep the yellow of the flowers as a more unified and simpler shape. 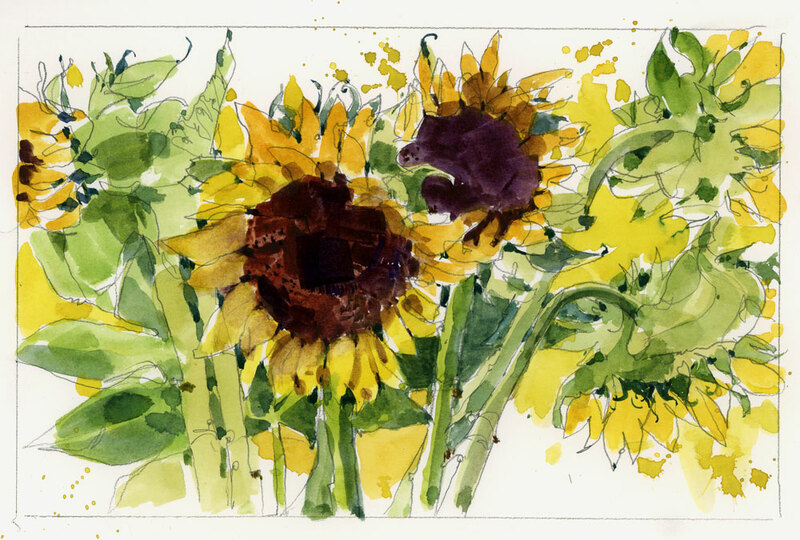 These are sunflowers, after all, and their essence seems to have gotten lost in the first sketch. People often ask how long it takes to do a painting or a sketch and usually I don’t know. I always lose track of the time. Except today I know exactly how long it took to do this half sheet. The church bells chimed at 9 when I was setting up my easel and then again at 11 when I was putting everything back in the car. This week I have been thinking about how to treat foliage in watercolour so the last three paintings have had good sections of trees. Today I tried a few different brushes because I instead of making deliberate marks for every leaf I wanted the brush to do some of the texture work for me. I used a hake and a squirrel mop brush, both much more floppy than I’m used to. If you treat the foliage quite dryly, you can get some nice texture from both of these brushes.